How much can I save on my energy bill by adding a radiant barrier? This is a question we get often but it’s hard to answer because energy savings are usually a comprehensive situation. Truth be told, anyone promising a certain amount of savings without fully seeing your specific application area should raise some concern. Too often the benefits are oversold and many people wind up confused and leery of believing radiant barrier actually works. 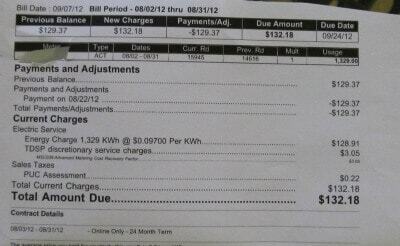 How well it converts in to energy savings however, is a different matter. In some cases just adding a radiant barrier might save a good percentage, while in other instances it might only save a small percentage. Radiant barrier should be part of a comprehensive effort to make a home more energy efficient. The key to energy savings is really in regulating heat gain/heat loss. This can be done with a radiant barrier, but other improvements can also be made to help this. Weatherstripping, air sealing, window replacement or window tinting, duct sealing, etc. all contribute to controlling heat transfer. Reducing the amount of heat coming in to a home (or building) in the summer months can make a big impact on comfort first, then on energy; reducing the amount of heat gain means less air conditioning is needed to cool off the inside. Oftentimes the air conditioning runs all day, even after the sun has gone down, because of how much heat the home has absorbed. Radiant barrier keeps the home from absorbing that heat, so it stays cooler easier and the stress on the air conditioning unit is lowered. The same basic principle is true in the winter months as well. Heat loss occurs because the heat inside wants to escape from your home and you continually run the heater to keep the home from getting cold. If you were able to keep more heat inside the home, you’d spend less money because you wouldn’t be constantly replacing lost heat! These two applications (summertime and wintertime) are the main way that radiant barrier effects energy consumption. Savings in Glen Allen, VA.
More savings in Glen Allen, VA.
Savings average over a wide range, which we explain in more detail on our page: Expected Savings When Adding a Radiant Barrier. Keep in mind that radiant barrier is not a substitute for traditional insulation; both regular insulation AND a radiant barrier work together to give you the best possible results. Glen Allen, VA: Here we have an example of a consumer in Virginia who has traditional insulation on his attic floor and he added a radiant barrier both on his rafters (because he had storage and an HVAC unit in his attic) as well as on his floor (to maximize his winter time heat retention). 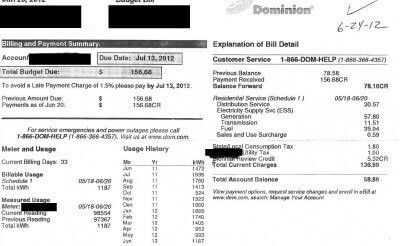 He was generous enough to share his energy bills (one from 2011 and one the following year in the same month) to demonstrate his particular savings. Below are the bills, side by side (2011 on the top, 2012 on the bottom). *June 2011 was the month he installed AtticFoil® radiant barrier foil in his attic space. He did the installation himself, so he did not pay for labor costs, just material costs. He installed the foil using a hybrid of the staple-up and the over-the-insulation methods. It is not necessary to do both methods in order to get good results. His results were immediate; his bill was lowered while he was about 70% done with the installation because he was already improving the heat load. Since cost per KW can change from year to year, it might be more helpful to compare KW usage from year to year to see how you are consuming less energy. Not only were his surface temperatures decreased, but his attic air temperature also dropped to within 10 degrees of ambient temperature. For more information on this installation, please see our Radiant Barrier Case Study: Virginia page. Jacksonville, FL: This customer sent in his savings that he charted over the past year. 3 This is the first full month with 70% of Attic Foil coverage. 5 Note that the savings percentage is dropping for 1 year savings. 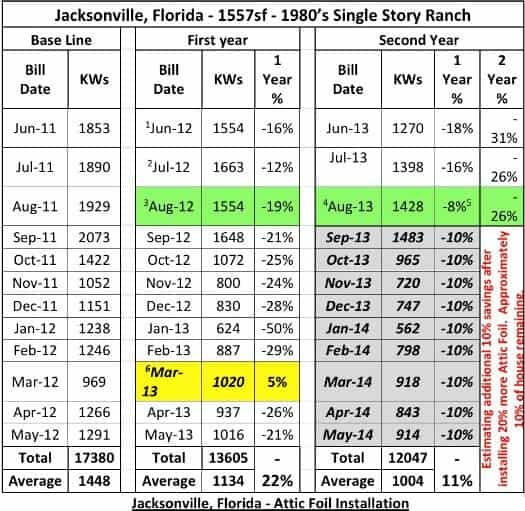 This is because there was already a savings from the year before so I put in a 2 year percentage to compare to 2011 before any Attic Foil was installed. 6 March 2013 is the only month higher than the same month the year prior. I stayed 16 days at home recovering from back surgery with TVS and HVAC on all day. Here is what he had to say about his experience: “For those that are reading this and trying to decide whether adding Attic Foil is worth it I will give the punch line first. I saved $537.79 (-23.82%) in the past 12 months compared to the 12 months prior. I am not even finished; having just 2 weekends ago (14 months after starting) got the installation from 70% to about 90%. I also still need to install 40′ of Ridge Vent and 15 additional 6″ soffit vents (I had almost no ventilation) before I think I will see the full benefit of this system. However, even with the slow start and drawn out installation (for me), having to hire and train two different helpers and buy extra tools for them, I have a 12 month (or less) return on investment. Not bad for any investment plus house was more comfortable almost immediately and started saving even with just a partial installation completed (see chart / footnotes). 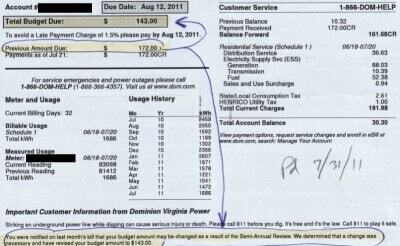 I now actually look forward to the Electric Bill coming so I can plug the numbers into my chart.”.